Forget January, September is my New Year. Maybe it's the back-to-school energy in the air or the first of the changing leaves, but the day after Labour Day is my time to boot up new projects and set new goals. This year, one goal I've set for myself is to get out of my "city bubble" and explore the nature that's practically at my feet. Goal #2: share the experience with my friends. Where will the new "New Year" take you? Looking for easy access to wild spaces close to home? Check out our list of 6 amazing hikes in and around Vancouver! Big news! Making an official announcement with Mayor Mike Clay, Modo CEO Nathalie Baudoin and staff unveiled the first two carsharing vehicles in Port Moody at a press event on August 13. Read about it in the Tri-Cities NOW. Just announced: Our family-friendly footrace returns March 22, 2015! 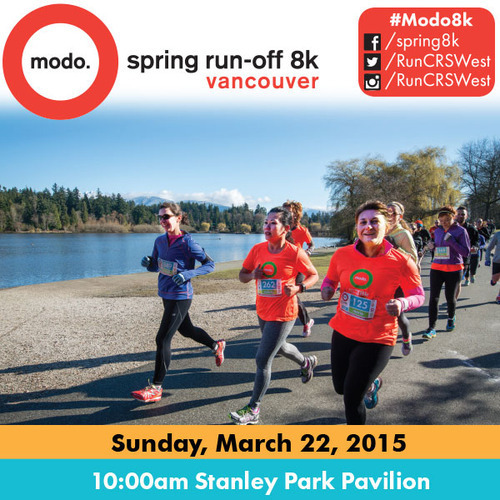 Eager earlybirds can register for the #Modo8k at a deep discount this Saturday at the Eastside 10K, another Canada Running Series footrace. Just look for our booth! We no longer have a vehicle here due to building construction. Find a 2014 red Toyota Prius C (#567), a 2013 brown Fiat 500 convertible (#568), and a 2014 silver Nissan Rogue (#569) in the underground parkade at 1051 Broughton Street, on the corner of Comox Street. A 2013 white Dodge Grand Caravan (#548) has replaced the orange Grand Caravan. A 2009 blue Nissan Cube (#238) is here temporarily until its permanent home is ready. A 2014 white Toyota Prius V (#563) is here temporarily until its permanent home is ready. A 2013 grey Chevrolet Orlando (#562) has replaced the blue Nissan Cube. Find a 2013 green Fiat 500 convertible (#512) in the lane between Main Street and Gore Avenue, 30 metres north of East Georgia Street. Find a 2014 red Fiat 500L (#529) in the parkade at 6385 Cambie Street, just north of West 48th Avenue on the west side of the street. Accessibility warning: this vehicle can only be reached via a flight of 20 stairs. Find a 2013 red Dodge Grand Caravan (#534) in the 5100 block of Beresford Street, just east of Burlington Avenue. Our stall is on the north side of the street, slightly raised from street level. Find a 2012 red Nissan Versa Hatch (#429) on Eleventh Street. Find a 2012 blue Toyota Prius V (#370) on the west side of Knowle Street, in front of Port Moody City Hall, north of the rotunda at Newport Drive. Find a 2014 white NIssan Versa Note (#557) in front of 400 Capilano Road, just west of Morrissey Road, in a designated stall on the north side of the street. 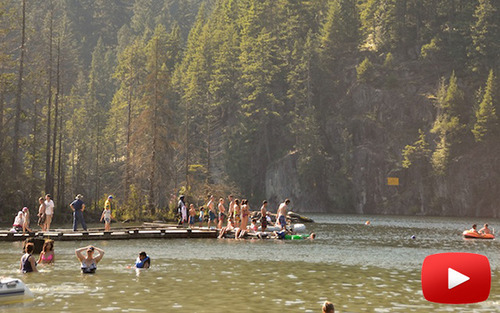 Pursuing mountain peaks and freshwater lakes, Modo members hit the Sea-to-Sky in droves this summer – and ridesharers were among them. Rideshare platform HitchWhistler teamed up with Modo to explore a trio of lakes – Garibaldi, Elfin and Buntzen. Get inspired by the stellar videos and photos they captured as proof that the right wheels and good company can transform a nice summer road trip into a full-on expedition. 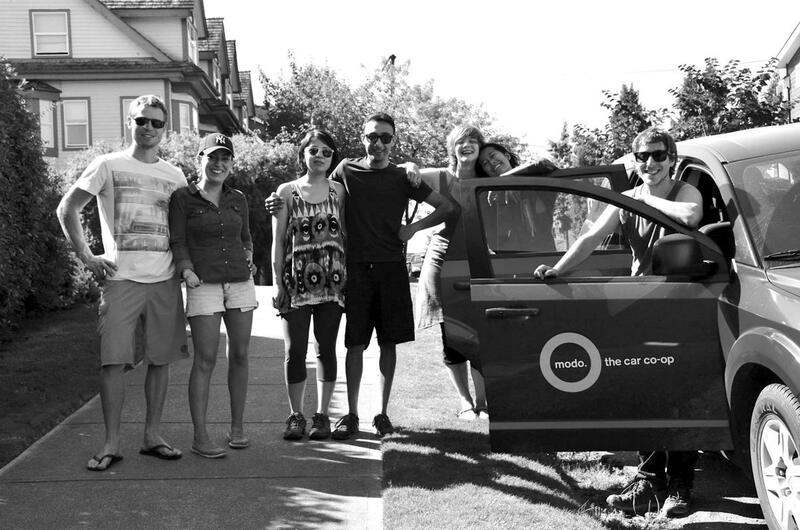 Modo Member Perk: Want to rideshare with HitchWhistler? Click to get a free year membership! >> EV UPDATE Electric vehicles aren't just the future, they're also the present here in BC. Emotive serves up a State of the Industry report with this guest post. >> PRO-TIP Have you noticed a PVRT on your invoice? Bone up on this tax on our blog. >> HIGH-FIVES Modo volunteers logged 100+ shifts this summer – and they still wanted to give back! >> TAKE A HIKE Join us in supporting this adventure-based learning program for at-risk youth! >> TAKE 6 LOCAL HIKES Make getting back to nature part of your new "New Year" with these 6 hikes. RIPE is the Vancouver Farmers Markets' annual dinner fundraiser, a harvest celebration showcasing collaborations between the region's top farms and farm-to-table restaurants. The 2014 line-up has been announced and tickets are now available! 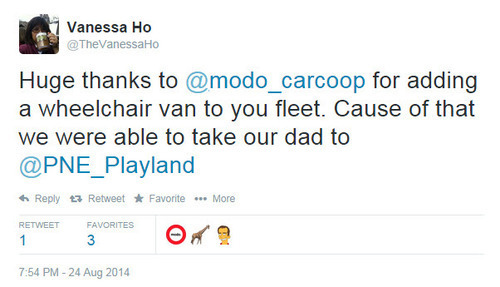 You’ve received this newsletter because you’re a friend of Modo The Car Co-op. Want to send feedback about our newsletter? Email us at newsletter@modo.coop.